Published in L. Frank Baum's first children's book, Mother Goose in Prose (1897), illustrated by Maxfield Parrish. 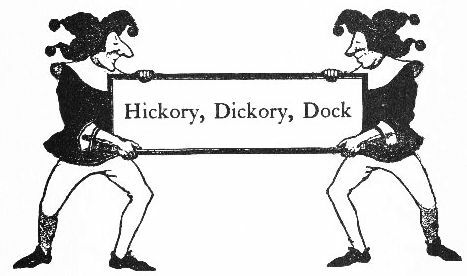 You might also enjoy the Mother Goose collection of nursery rhymes, including Hickety Dickety Dock. The mouse ran up the clock. Within the hollow wall of an old brick mansion, away up near the roof, there lived a family of mice. It was a snug little home, pleasant and quiet, and as dark as any mouse could desire. Mamma Mouse liked it because, as she said, the draught that came through the rafters made it cool in summer, and they were near enough to the chimney to keep warm in wintertime. Besides the Mamma Mouse there were three children, named Hickory and Dickory and Dock. There had once been a Papa Mouse as well; but while he was hunting for food one night he saw a nice piece of cheese in a wire box, and attempted to get it. The minute he stuck his head into the box, however, it closed with a snap that nearly cut his head off; and when Mamma Mouse came down to look for him he was quite dead. Mamma Mouse had to bear her bitter sorrow all alone, for the children were too young at that time to appreciate their loss. She felt that people were cruel to kill a poor mouse for wishing to get food for himself and his family. There is nothing else for a mouse to do but take what he can find, for mice can not earn money, as people do, and they must live in some way. But Mamma Mouse was a brave mouse, and knew that it was now her duty to find food for her little ones; so she dried her eyes and went bravely to work gnawing through the baseboard that separated the pantry from the wall. It took her some time to do this, for she could only work at night. Mice like to sleep during the day and work at night, when there are no people around to interrupt them, and even the cat is fast asleep. Some mice run about in the daytime, but they are not very wise mice who do this. At last Mamma Mouse gnawed a hole through the baseboard large enough for her to get through into the pantry, and then her disappointment was great to find the bread jar covered over with a tin pan. "How thoughtless people are to put things where a hungry mouse cannot get at them," said Mamma Mouse to herself, with a sigh. But just then she espied a barrel of flour standing upon the floor; and that gave her new courage, for she knew she could easily gnaw through that, and the flour would do to eat just as well as the bread. It was now nearly daylight, so she decided to leave the attack upon the flour barrel until the next night; and gathering up for the children a few crumbs that were scattered about, she ran back into the wall and scrambled up to her nest. Hickory and Dickory and Dock were very glad to get the crumbs, for they were hungry; and when they had breakfasted they all curled up alongside their mother and slept soundly throughout the day. "Be good children," said Mamma Mouse the next evening, as she prepared for her journey to the pantry, "and do n't stir out of your nest till I come back. I am in hopes that after tonight we shall not be hungry for a long time, as I shall gnaw a hole at the back of the flour barrel, where it will not be discovered." She kissed each one of them good-bye and ran down the wall on her errand. When they were left alone Hickory wanted to go to sleep again, but little Dock was wide awake, and tumbled around so in the nest that his brothers were unable to sleep. "I wish I could go with mother some night," said Dock, "it 's no fun to stay here all the time." "She will take us when we are big enough," replied Dickory. "We are big enough now," declared Dock, "and if I knew my way I would go out into the world and see what it looks like." "I know a way out," said Hickory, "but mamma wouldn 't like it if we should go without her permission." "She need n't know anything about it," declared the naughty Dock, "for she will be busy at the flour-barrel all the night. Take us out for a little walk, Hick, if you know the way." "Well," said Hickory, "I 'd like a little stroll myself; so if you 'll promise to be very careful, and not get into any mischief, I 'll take you through the hole that I have discovered." So the three little mice started off, with Hickory showing the way, and soon came to a crack in the wall. Hickory stuck his head through, and finding everything quiet, for the family of people that lived in the house were fast asleep, he squeezed through the crack, followed by his two brothers. Their little hearts beat very fast, for they knew if they were discovered they would have to run for their lives; but the house was so still they gained courage, and crept along over a thick carpet until they came to a stairway. "What shall we do now?" whispered Hickory to his brothers. "Let 's go down," replied Dock. So, very carefully, they descended the stairs and reached the hallway of the house, and here they were much surprised by all they saw. There was a big rack for hats and coats, and an umbrella stand, and two quaintly carved chairs, and, most wonderful of all, a tall clock that stood upon the floor and ticked out the minutes in a grave and solemn voice. When the little mice first heard the ticking of the clock they were inclined to be frightened, and huddled close together upon the bottom stair. "What is it?" asked Dickory, in an awed whisper. "I do n't know," replied Hickory, who was himself rather afraid. "Is it alive?" asked Dock. "I do n't know," again answered Hickory. Then, seeing that the clock paid no attention to them, but kept ticking steadily away and seemed to mind its own business, they plucked up courage and began running about. Presently Dickory uttered a delighted squeal that brought his brothers to his side. There in a corner lay nearly the half of a bun which little May had dropped when nurse carried her upstairs to bed. It was a great discovery for the three mice, and they ate heartily until the last crumb had disappeared. "This is better than a cupboard or a pantry," said Dock, when they had finished their supper, "and I should n't be surprised if there were plenty more good things around if we only hunt for them." But they could find nothing more, for all the doors leading into the hall were closed, and at last Dock came to the clock and looked at it curiously. "It does n't seem to be alive," he thought, "although it does make so much noise. I 'm going behind it to see what I can find." He found nothing except a hole that led to inside of the clock, and into this he stuck his head. He could hear the ticking plainer than ever now, but looking way up to the top of the clock he saw something shining brightly, and thought it must good to eat if he could only get at it. Without saying anything to his brothers, Dock ran up the sides of the clock until he came to the works, and he was just about to nibble at a glistening wheel, to see what it tasted like, when suddenly "Bang!" went the clock. It was one o'clock, and the clock had only struck the hour; but the great gong was just beside Dock's ear and the noise nearly deafened the poor little mouse. He gave a scream of terror and ran down the clock as fast as he could go. When he reached the hall he heard his brothers scampering up the stairs, and after them he ran with all his might. It was only when they were safe in their nest again that they stopped to breathe, and their little hearts beat fast for an hour afterward, so great had been their terror. "You see, my dears, your mother knew best when she told you not to stir from the nest. Children sometimes think they know more than their parents, but this adventure should teach you always to obey your mother. The next time you run away you may fare worse than you did last night; remember your poor father's fate." But Hickory and Dickory and Dock did not run away again. Add Hickory, Dickory, Dock to your own personal library.